Revealed at CES in January, the PowerLine II USB-C Cable with Lightning Connector is Anker's first attempt at producing a Lightning cable that connects via USB-C. Preorders for the cable are now open, with Anker expecting to start shipping it to customers later in February. 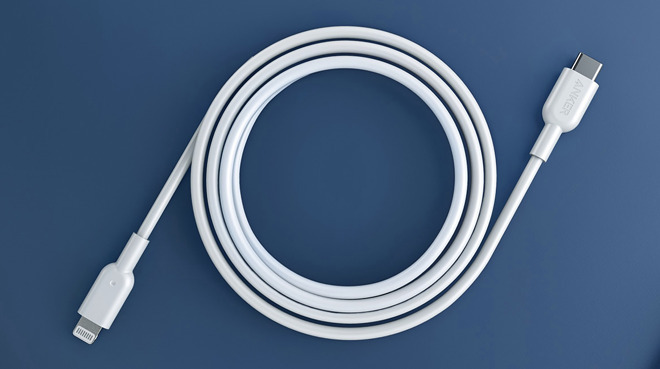 Measuring three feet in length, the cable is claimed to have a 12,000 bend lifespan, which should allow it to keep up with the rigors of everyday cable usage. According to Anker's internal testing, it is 12 times more durable than other cables, though it is unclear what that metric equates to in average usage. The company is confident enough to also offer a lifetime warranty on the cable. It is one of the first cables to be offered under Apple's MFi licensing, meaning it is officially sanctioned for use with Apple products by the iPhone producer itself. Apple has been relatively slow in opening up this product category to third-party vendors, but it is likely that more options will be available in the coming months as other firms offer up their versions. By connecting using USB-C instead of normal USB, the cable allows for owners of more recent iPhones to use its the protocol's Power Delivery support, enabling fast charging when used with a higher-wattage power adapter. It also enables for iPhones and iPads to be charged directly from a MacBook, without requiring any extra dongles. Anker is pricing the cable at $15.99, undercutting Apple's own version by about $3. While it has been shown in other color options, it is at first only available in white. You have to order through Anker's website, pay tax and shipping brings it in around $21 ... Not such a great deal until they stock it and sell through Amazon prime. Until Wireless(charging,data transfer) becomes cost effective, widespread adoption or new better port standard on horizon, adopting USB-C on all Apple products is a wise thing. Hope, happens sooner than later. Than, no need for USB-C to lightening cable and stupid price complains. I will pay extra for reliability and peace of mind. Why, so you only have to carry one charging cable for all of your devices? I tried that on one trip, and it did not go well. Now I carry a cable for each device I take. And frankly, I’d hate to have to replace all of my Lightning cables and accessories, just so they are compatible with my iPad, or MacBook, which I use in far fewer places than I do my iPhone — especially if it’s a short term transition to a portless iPhone. I’d be surprised to see statistics that indicate most people are using their ports for iPhone backups and data transfer. The desire for that seems primarily a concern of people on these Apple tech forums. Anecdotally speaking, most people I know backup via iCloud, or not at all. Maybe I’m not most people, but I routinely use a cable for transferring pictures from my phone to my computer. I also use a cable for CarPlay on a daily basis (which is USB A, BTW) My son gave me a wireless charging mat that I have on my night stand - it’s convenient, I guess, but in the 2 weeks I’ve had it, I’ve already woken up once to an uncharged phone because it wasn’t placed perfectly on the mat. It also doesn’t let me prop my phone up so I can easily see it to hit snooze. I’m just not seeing how wireless charging is so great. The advantage of having a ‘universal cable’ that will charge everything is not that you only have to bring one cable with, rather that if you forget one cable, you can use one of the others, or if you forget yours totally, there’s more likely to be someone else with one you can borrow. Not MFi, and despite working fine, they may not always. Yeah, takes the wind out of sails of those who claim Apple is routinely scheming to find new ways to ripoff consumers while twirling its waxed mustache. Oops. Apple’s cables have always been expensive - you can go to Monoprice and get a comparable, MFI certified lightning cable for $7-8. That’s not terribly different from how it is for other brand name items, though, so Apple is hardly unique here, and they price theirs identically to the USB A version, so they’re being consistent. I’m sure other, decent quality cables will become available for less with time; we’re still early in the game. Given that the majority of people use their cables only for charging, not data transfer, it would be nice to have cheaper, charging-only cables available. Without some standard for indicating cable capabilities, that would be a step in the wrong direction. Sure, that would be easy enough to accomplish. In reality, though - your concern is exactly what we have with USB C. Not all cables (or USB C ports) are capable of all functions, so when you see a USB C connection you have no idea what you have, other than a USB C plug. It's part of what makes USB C a mess. I realized this, but one year later, absolutely no issues and saved me a bundle. I don't know that this proves the point you suggest. How much would this cable cost if Anker didn't have to pay a licensing fee to Apple? Then there's the issue of Apple's USB-C cables costing so much more than USB-A equivalents until recently. When I bought the absolute top-of-the-line laptop from Apple, even with the understanding that it meant replacing a bunch of cables, it was annoying in the extreme to discover that Apple's price for a USB-C-to-Lightning cable was half-again what it cost for a USB-A version. The difference has shrunk over time, but even now, two years later, the 2m USB-C cable still costs more than the USB-A version, and the A version was already more than double what it costs from other vendors. Given the insanely high margins in that product category -- in the hundreds of percent -- and the fact that for a long time Apple wouldn't even let anyone else make USB-C Lightning cables, yeah, that seemed like gouging. NOW they do. For the better part of two years the C versions cost half-again what the A version did. Even now, the longer USB-C to Lightning still costs more than the USB-A version. [...] I’m sure other, decent quality cables will become available for less with time; we’re still early in the game. That's little comfort to those who already use Apple's latest computers and aren't able to wait for cable prices to fall.